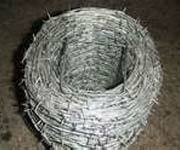 We are into offering superior quality Galvanized Barbed Wires that are manufactured with sharp points and edges. The Galvanized Barbed Wires range is available in various sizes and can be customized as per the demands of the clients. The Galvanized Barbed Wires range is highly appreciated for rust resistant features, non abrasive property and resistant to wear and tear.